Haruna Kimishima knew her music had found an audience overseas when her Twitter DMs began to fill up with English. Kimishima’s tracks are grounded in rock but often incorporate elements of hip-hop and electronic music, and her vocal delivery moves from delicate spoken word to primal screams. In a year where the West hasn’t paid much attention to Japanese music in general, it has been that formula — which she deployed brilliantly on her April full-length debut “Haru to Shura” (the title is a nod to a collection of poems by Kenji Miyazawa titled “Spring and Asura”) — that has gotten her noticed. 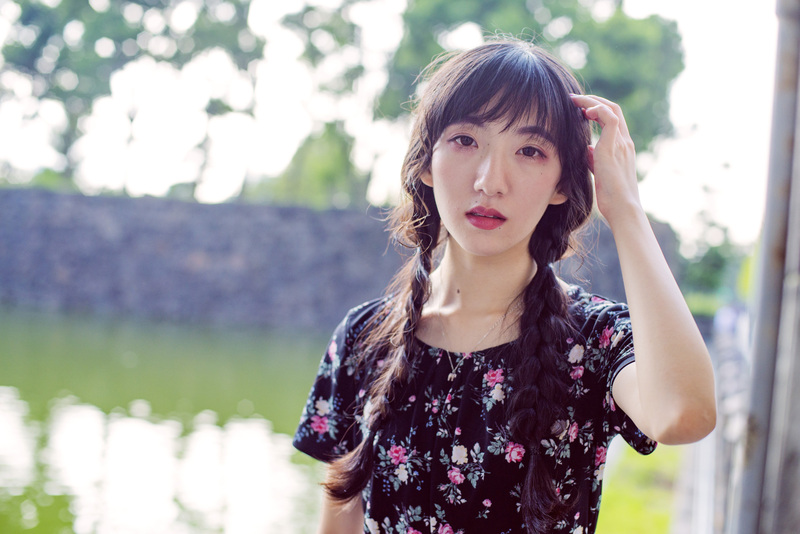 The album became a favorite of Anthony Fantano, operator of the YouTube channel The Needle Drop, who gushed that “while her new record is billed as J-pop … (it’s) actually so much more.” She has also won praise from music website Stereogum, and her LP sits at No. 39 on the “Top Albums of 2018” list of the user-aggregated ranking site Rate Your Music at time of writing. In late September it passed 1 million plays on Spotify, a rarity for Japanese albums on the streaming platform. “Japanese people tend to be more focused on the lyrics themselves,” she notes. Not a bad thing, considering her words offer metaphor-heavy observations on the human condition mixed with the humdrum details of daily life — the name of a train line and an album by Supercar on “Narashite,” for example. Kimishima grew up in Yokohama’s Isogo Ward, which she thinks influenced an approach to songwriting that’s big on sudden turns. Kimishima’s interest in music started in junior high school. She and a friend were into a band called Fujifabric, which led them to discover acts such as CreepHyp and bands in the realm of subculture-kei (a term for obscure micro-genres). In college she started listening to Western groups like the Pixies and Yeah Yeah Yeahs, and that got her interested in writing her own songs. These small details are really what sets “Haru to Shura” apart from other new J-pop acts, but the topper has to be Kimishima’s vocals. She admits she’s not a polished singer, but when she started working on “Haru to Shura,” she says she found her niche. This Pixies-esque quiet-loud drama in her singing works in tandem with a set of lyrics dwelling on existentialist themes. “I think about how we go about living our lives as humans. I think about how each person is their own soul, how everyone is lonely. It’s impossible to understand other people completely,” she says, adding that she’ll often feel out-of-place in public situations and that she keeps locked social media accounts that serve as private journals. The things she writes about usually end up becoming songs. “Haru to Shura” doesn’t feature any answers, just catharsis and a ton of highlights — whether it’s the slow build-up to an out-of-breath roar over a hip-hop beat on “Underground,” or a mini-sermon that starts by questioning the existence of god and ends with an embrace of life on “Sekai o Torikaeshite Okure.” Kimishima says she even kept one song, “Kick In the World,” off the album because there was “already too much drama — it would’ve been too much.” Few releases carry this kind of passion, and a collection of tracks that features a female singer screaming at the world pretty much captures the zeitgeist of 2018. “It’s … a good album,” Kimishima says with a laugh after being asked what she thinks of “Haru to Shura” months after its release. She has a bias towards her latest material, which she’s working on at the moment, but says she likes her spring release because of how it signalled growth. And, of course, it has introduced her to an international audience. Haru Nemuri played a show in Taiwan this week, and Kimishima hopes to tour Europe and North America in the near future. And that’s by no means out of the question. Kimishima’s continuing rise in popularity can offer some pointers to smaller Japanese acts hoping to make inroads abroad at a time when big names demand all the attention. First thing’s first: Keep those DMs open. Haru Nemuri plays “Break on Through #13” at Guild in Takasaki, Gunma Prefecture, on Oct. 13 (9 p.m. start; ¥2,000); Ototohito 2018 at Musashino Art University’s Takanodai Campus in Kodaira, Tokyo, on Oct. 26; and “Odd Style Vol. 3” at Space Odd in Shibuya Ward, Tokyo, on Oct. 26 (6 p.m. start; ¥2,800 in advance). For more information, visit www.ねむいっす.com.